Two months ago, people in Tampa were talking about a division title. After a loss to the Titians 23-17 and then the Panthers 38-19 and who can forget the 41-14 loss to the Jaguars, we have little choice but to embrace a spoiler's role. The Bucs are now preparing to face the Cowboys in Saturday night's nationally televised matchup at Raymond James Stadium. This game is a sellout, but it should be a Cowboy friendly crowd as the Bucs try to cripple the playoff hopes of America's Team. The Glazers will also be watching, who have witnessed the Bucs drop seven consecutive games to fall into the NFC South basement at 4-9. Last week's 41-14 setback at Jacksonville, fueled by a franchise record-tying seven turnovers, ramped up speculation about the job security of head coach Raheem Morris. While the Cowboys are playing for an NFC East title, the Bucs will be playing for pride. In Tampa Bay's first prime-time appearance since 2008, the Bucs defeated Indianapolis 24-17 on Oct. 3, setting a franchise mark at home by rolling up 466 yards. The Bucs are going to need some of that magic if they hope to beat the Cowboys. Bucs didn't go down easy with the Packers clinging to a two-point lead and trying to fend off a late rally. Rodgers threw a 40-yard touchdown with 2:55 left and the Packers survived a scare from the Buccaneers for a 35-26 victory. Freeman threw for 342 yards with two touchdowns and two interceptions for the Buccaneers, who have lost four straight, but didn't back down against the reigning Super Bowl champions. Blount had 107 yards rushing for Tampa Bay, including a rambling 54-yard touchdown run in the second quarter where he broke at least six tackles. The Buccaneers twice pulled within two points of the Packers during the second half only to see Green Bay respond with touchdowns on its ensuing possessions following both Tampa Bay scores. Sunday's most pivotal moment came late in the fourth quarter when the Bucs tried the team's second onside kick of the day. Rather than kick it deep and let the defense try and get the ball back with over 4 minutes remaining, the Packers took over at Tampa Bay's 46. Three plays later, wide receiver Jordy Nelson badly beat cornerback Myron Lewis down the left sideline and Rodgers hit him in stride for a game-clinching 40-yard touchdown. The Bucs are on the road again next week as they travel to Tennessee to take on the Titans. 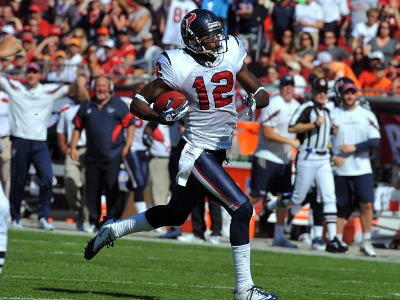 The Buccaneers were manhandled by the Texans 37-9 as they could not stop Arian Foster and the rest of the Texan's offense. Poor play from the Bucs defense and a 4 sack, 3 interception day for Josh Freeman had Bucs fans heading for the gates early in the 3rd quarter. The Bucs offense didn't get into the end zone until the fourth quarter for the second game in a row. Defensively, the Bucs tackled poorly and yielded 268 yards in the opening half and 420 overall. Raheem Morris said, "Terrible game. Completely, put the blame on me for this one. ... We started the game just like we finished it. Poor job by myself. I'll take complete responsibility for that. I refuse to believe that our guys are that bad, so it has to be my fault." I believe most fans have come to the conclusion that the Bucs, as young as they are, are that bad. The Bucs have now lost three straight and four of five following a 3-1 start. This week it doesn't get any easier when they travel to Green Bay to take on the Packers. Good luck, but I think we all know how this is going to end. Poor tackling and nine penalties, helped the Saints beat the Bucs 27-16. Drew Brees threw two touchdowns and the trio of Chris Ivory, Pierre Thomas and Darren Sproles rushed for 175 of the Saints' 195 rushing yards helped push the Saints past the Bucs.The Buc's offense couldn't match the Saints' ability to make plays when they were needed the most. QB Josh Freeman went 27 of 37 passing for 281 yards and RB LeGarrette Blount picked up 72 yards on 13 carries, but the Bucs only converted two of their 12 third downs and repeatedly failed to capitalize on opportunities. Once again playing a role in some wasted chances were more ill-timed penalties. Tampa Bay miscues drew nine flags for 80 yards. As the Bucs struggles to move the chains Drew Brees and New Orleans were their typical, efficient selves, going five-for-10 in such situations. The Saints entered Sunday tops in the NFL in conversion percentage. Which was too much for the Bucs to overcome. This week the Bucs are home for some home cooking as the Texans come to town. The Buccaneers lost four starters, including running back Earnest Graham, to injury in Tampa Bay's 24-18 loss to the Chicago Bears on Sunday. Not sure the Bucs will think that the losses they suffered were worth playing in the NFL's International Game in London. In the first quarter, the Bucs lost starting running back Earnest Graham and rookie middle linebacker Mason Foster to ankle injuries. In the second half, free safety Tanard Jackson suffered a hamstring injury and Jeremy Zuttah was lost to a knee injury. The bye week could not have come at a better time with all the injuries to the Bucs as they will need that time to heal. To add insult to injury the Bucs still had a chance to win the game late until Josh Freeman threw his season-high fourth interception of the day and sealed the Bucs fate. The Bucs need to get well quick for they soon will have to travel to new Orleans to take on the Saints. A week after the Buccaneers were dismantled in San Francisco and lost by 45 points, Tampa Bay quarterback Josh Freeman showed that the Buccaneers are still a team to watch. Freeman threw for 303 yards and two touchdowns and Earnest Graham rushed for 109 yards in place of LeGarrette Blount and helped the Buccaneers outlast New Orleans 26-20 on Sunday. New Orleans had four turnovers in the game. The Buccaneers defense held the Saints under 30 points for the second time this season and shut down the Saints' rushing attack, which was held to 70 yards. Tampa Bay safety Tanard Jackson, playing in his first game since being reinstated by the NFL after being suspended more than a year for violating the league's substance abuse policy, had an interception in the first half to set up a Buccaneers touchdown. This win pulled the Buccaneers into a first-place tie with the Saints in the NFC South and ended a Saints four-game winning streak. 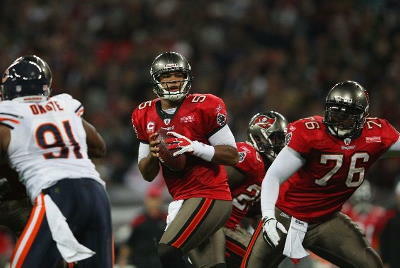 The Buccaneers will take the momentum from this week's win to London as they prepare for the Chicago Bears. The bad news is this game counts as a home game for the Buccaneers. The good new is that the game will be televised in the Tampa Bay area on Sunday. Alex Smith threw for three touchdowns and Frank Gore ran for a touchdown in his second straight 100-yard rushing game as the San Francisco 49ers dismantled the Tampa Bay Buccaneers 48-3 on Sunday. This matches the worst loss ever for the Buccaneers. 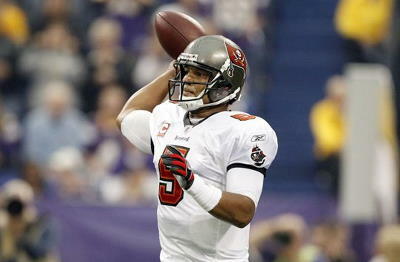 Josh Freeman went 17 for 33 for 187 yards with two interceptions and two sacks. Freeman never found the flow that had made him so effective in the rout here last November and the Bucs (3-2) were a step behind in a short week after beating the Colts on Monday night. Raheem Morris also got into the act receiving an unsportsmanlike conduct penalty with 9:05 left in the third quarter for yelling in the face of a line judge. Just over five minutes later, safety Sean Jones had a late hit to a 49er player's head after the play was over. He received a $10,000 fine for that play from the NFL later that week. 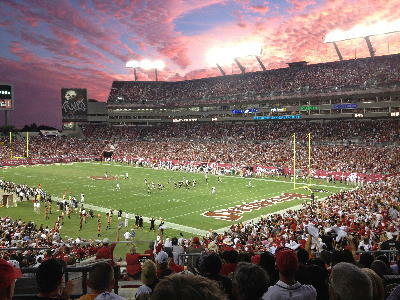 The Buccaneers will face another crucial home test this week as the division-leading New Orleans Saints come to Tampa. A New Orleans win would give the Saints a two-game division lead, but a Buccaneers win would knot up the top of the division and set up a season-long chase for the title. The Buccaneers have no time to lick their wounds after last weekends embarrassing loss to the 49ers. It's time to focus on the Saints. On Monday Night Football the Bucs and Colts played an ugly, penalty filled, close game and as long as the Bucs could keep it close, they would take it. Josh Freeman threw for 287 yards and a touchdown while LeGarrette Blount battered the Colts for 127 yards and a touchdown. The Tampa Bay Bucs fans have become used to these late rallies as the Bucs led by Josh Freeman drove late to beat the Colts 24 - 17. Freeman scrambled for a huge first down on the winning drive to keep the drive alive. Two plays later Blount broke a 35 yard touchdown run dragging a Colts defensive back the final few yards before diving for the pylon and scoring the winning touchdown. This was the first sold out crowd for the Bucs at home this season and the atmosphere was electric. The Bucs are one of the youngest teams in the NFL yet it appears the Bucs are ready to challenge for the NFC South Division. 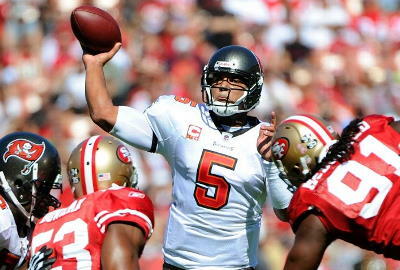 The Bucs must travel to San Francisco next weekend to play the NFC West Division leader 49ers. 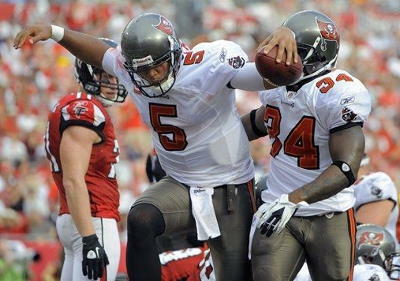 The dirty bird dance seemed uncharacteristic for quarterback Josh Freeman, but you must remember this was his first rushing touchdown of his career. This was also the first victory over the Falcons in the last 6 meetings so a little dancing was to be expected. Three years of frustration came to an end as the Buccaneers finally beat their NFC South rivals with a 16-13 victory on Sunday. The Buccaneer's defense forced three turnovers and sacked Matt Ryan four times in the defense's best performance to date this season. RB LeGarrette Blount also had a good game, rushing for 81 yards on 24 carries helping the Bucs burn out the rest of the game clock. In the closing moments of Sunday's game, Freeman escaped the pocket and ran for 13 yards to the Tampa Bay 33. That's where he was met by the oncoming safety William Moore, who plowed into Freeman with a head-first hit to Freeman's helmet. Later in the week the NFL fined Moore $7,500 for that helmet-to-helmet hit. Former Tampa Bay coach Jon Gruden will be returning to Raymond James Stadium for an NFL game for the first time since he was dismissed after the 2009 season. This time, Gruden will be there as an analyst for Monday Night Football as the Buccaneers play the Colts this Monday. The Bucs entered the locker room at half-time against the Vikings down 17-0. The Vikings out gained the Bucs 284 yards to 62 yards in the first half and it looked like the game was over at the half. The Bucs came out at after half-time as if the game was tied still confident they could win despite a 17-0 deficit. Remember, the late game comeback is what Josh Freeman has been known for in his 26-game career. Arrelious Benn's 25 yard touchdown reception and LeGarrette Blount's 4-yard touchdown run with 31 seconds left sent the Buccaneers past the Vikings 24-20 on Sunday, completing Freeman's 8th fourth quarter comeback out of his 14 career victories. The Bucs return home next weekend to take on division foe Atlanta Falcons. Normally when a team from the north comes to play a game in Tampa, in September, the advantage goes to Tampa. That wasn't the case this Sunday for QB Josh Freeman who had to leave the field in the third quarter to receive an IV for dehydration. I'm not saying it wasn't hot with the heat index reaching 102 degrees, but I am saying the team should be more than experienced in how to keep hydrated. The Lions mauled the Bucs 27-20 in the season opener. The Bucs defense had no answer for QB Matthew Stafford who threw for 305 yards and three TDs, including two to WR Calvin Johnson. The young Bucs defense gave up 431 yards and failed to pressure or sack Stafford all afternoon. The Bucs have many more questions than answers to start the season as they head off to Minnesota to play the Vikings next weekend. On the bright side, the Tampa Bay area will be able to see the game on TV next weekend. Lee Roy Selmon died Sunday night at St. Joseph's Hospital in Tampa. He was 56. Selmon, an All-American and the youngest of three football-playing brothers at the University of Oklahoma, was the first overall pick in the 1976 NFL draft by Coach John McKay's expansion Buccaneers. He quickly became the most distinguished member of a franchise that lost its first 26 games, then came within 10 points of a Super Bowl berth in the 1979 season. Mr. Selmon's giant ability on the football field was only eclipsed by the life he led away from it. The people of Tampa Bay named an expressway after him. He was athletic director at USF. If not for Selmon, the Bulls might never have gotten the support to start a football program 16 years ago. The Tampa Bay area lost a great man whose footprints are all over this community. He left our lives much better than he found them and his memory will live on. Funeral services will be held Friday at 10 a.m. ET at Idlewild Baptist Church, 18371 N. Dale Mabry Highway in Lutz. A visitation will be held Thursday from 5 p.m. to 8 p.m. at Exciting Central Tampa Baptist Church 2923 N. Tampa Street in Tampa. Final services and interment will be held in Oklahoma City at a later date.